The travel version of award-winning Blokus Â®, Travel Blokus is the perfect on-the-go strategy game for two! The simple rules take less than a minute to learn, yet the game has the depth to challenge both beginners and experts alike. 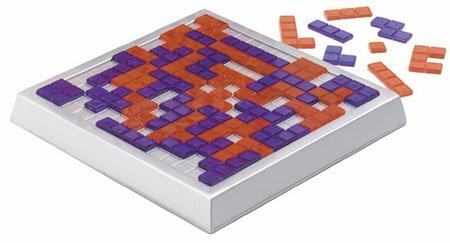 Set includes gameboard with 196 recessed squares, 42 game pieces in vibrant, translucent purple and orange in a storage tray, and guide. Other products in the "Blokus" series. The best Blokus to play when you only have two players. Very fun and strategic. I love Blokus in general, but I think this is my favorite version. It's small, easier to get a game started when you only need two people (you can play two players on the original Blokus game by playing two colors each, but this is more elegant). There are three essential Blokus games for people who really like the system - the original, Trigon, and Travel. Travel (or Blokus Duo) is the 2-player game which also happens to have a more mobile construction, rather than many travel versions of games which perfectly mimic the base game. It's quite fun and worth purchasing. An on the go version of a very fun game. A great game for the kids to play in the car on long trips or plane rides. Good price on a great game. A great travel game that allows you to get the fun strategy of the original on the road. Or if you love blokus and you and your wife are the only two around you can easily get the same fun.